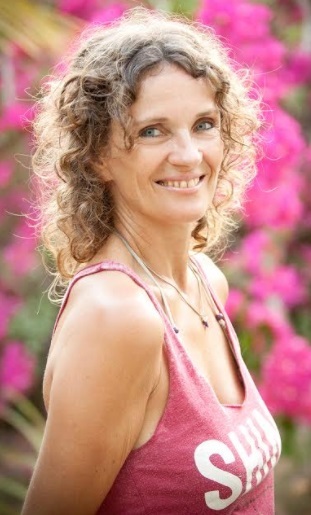 In 2001 I became the founder and director of Montezuma Yoga in Costa Rica. While growing up in Germany all I could envision for myself was living life in the sunshine, under the palm trees. After 20 years of soul searching and many detours that let me explore city life in Los Angeles and New York, I have found my dream life by the beach in the lush, tropical nature of Costa Rica. Because of my own experience I believe that everybody can live their dreams and that our work is to become clear and open to receive the gifts we all deserve. I trained in Vinyasa Flow, Anusara Yoga and Yin Yoga and my main mentors are Elena Brower & Rod Stryker. I am traveling with my partner Gaudan to teach international retreats in places such as Ibiza, Greece, Morocco or Iceland. I am a great networker and connector. All my life I have been excited to meet new people and bring people together, it makes me so happy to create connections, personal and business related and I seem to have a very good talent for it. I worked many years back in Germany in the music business as head of promotion and marketing and when I left Germany and moved to the US I started working with photographers as an agent and photo shoot producer….it was all about networking and connecting people and I loved it. Now with the yoga it’s the same, you have to be able to establish a good connection with people, touch their hearts, hold space for their trust and love to bring people together. My favourite time of the year is when I go teach my yoga retreats for a week with a group of likeminded people in beautiful locations like Greece, Iceland, Morocco, Ibiza or Costa Rica. Consistency and clarity. Many times in my life I wasn’t really sure where I was heading next, but I wanted to follow my heart and live a happy life, so I pursued my dreams with consistency and never gave up easily. I am not the most patient person, so it was challenging, but then again it always paid off. For example I started my yoga studio here in Costa Rica 16 years ago as one of the first studios. Back then most people thought I was crazy to bring the yoga here, it was all about relaxing and party! But I had my vision of what I would love to do and saw what was missing and just did it. I showed up every day to teach no matter if there was 1 person or 10 and it took a couple of years to establish it, but I believe it’s the secret to my success. I have seen many other people starting and not following through with their vision. Funny enough now Costa Rica and Yoga are booming everywhere! I also worked with a coach and always did a lot of writing exercises to find clarity, to check in with myself and to refine my vision. And I practice yoga now since 20 years which has helped me a lot to find clarity and to move through any challenges on and off the mat. to be an inspiration for other people to follow their heart and pursue their dreams. We have only this one life and it’s the greatest gift to live it fully. I wish to reach many people with my story and encourage them to share their own. To turn their stories, their challenges into their gifts, because we all have something unique and amazing to give. I’d love to see more people practice yoga, and I don’t mean the physical asana practice, but the yoga beyond asana, the willingness to take responsibility for your life and to work through your challenges and tap into your own healing power using practices like pranayama, meditation, yin yoga, mindfulness. I’d love to see more people surrender, slow down, enjoy stillness and trust their intuition, treat their bodies well and just BE. For my business I wish to continue to build my beautiful community and to share the yoga. I am currently working on my first online retreat package called Cultivating Intuition, a series of vinyasa flow videos and yin practices, exercises and live calls with me, which shall be ready by the end of the year. It’s a package of all the tools and practices that have helped me all these years to live an authentic and happy life. My current relationship! I always longed for a really happy relationship, to find a partner that would compliment me in sharing a similar vision of life. It took me 43 years to finally connect with that person, my partner Daniel, even though I knew him already for about 10 years. There is a right timing for everything and at some point I just realised very clearly that in order to co-create that “dream relationship” and attracting a different type of men, I needed to start shifting myself and get into my limiting beliefs and stories. So I did the work! And it’s a completely different relationship than any previous one. We are together over 8 years now and have co-created a really beautiful life. Of course there are also challenges, but the beauty is that we are holding space for each other and have the willingness to support each other to live our truth. We spend a LOT of time together, we travel and teach classes and retreats together (he plays a beautiful instrument, the HANG, in my classes) and then we take time off on our own to do something for ourselves and we keep it fresh like this. When I turned 30, I heard the call “now or never” and completely changed my life. I was living in Germany, was married, had a great successful career in the music business and life was pretty comfortable, but I always had this longing to leave Germany and live a different type of life. It was clear that I didn’t want to settle in Germany and have kids and when I had this clear call around my 30th birthday i decided to leave it all. I quit my job, left my husband (who is my best friend ever since) and moved 6 months later to Los Angeles, with no connections there and juts 2 suitcases in my hands. When I arrived in L.A. on the 23rd of Dec 1996 , I cried my eyes out for the next couple of days and thought I just made the biggest mistake of my life. But there was no going back either, and luckily pretty soon I met wonderful people, made good friends and started the yoga. So today when I look back I am just so grateful that I had the courage to make this change, despite all the fears and doubts and tears. I wouldn’t be here, living this happy life, if not for this challenging moment and the courage to do it anyway. 1. There is always a gift hidden in your story, you are here to find it and share it. And grant me the wisdom to know the difference. My yoga teachers Christi Minarovich and Elena Brower because they both live the yoga and have inspired me endlessly in their own ways. Elena Brower is also a great inspiration and mentor for my business. Rod Stryker is another wonderful teacher of mine with a very dedicated practice of yoga and meditation for more than 30 years with one consistent teacher and inspires me with his dedication and discipline. Also my students - I continue to meet so many wonderful people through my classes and retreats and get so much back from spending time together. My home: Costa Rica - for the wild and mostly unspoiled nature, the incredible variety of plants and animals and how you really live in close connection to monkeys and other animals. I became a total bird watcher since i live here! The sound of the jungle is something I don’t wanna miss. I am always excited about finding sources of inspiration for my life, through new studies, meeting inspiring people, new places and their culture. Lately I am also dreaming about meeting Orang Utan’s, so planning a trip in the near future to see them! Travel is on top of the list, I am always very passionate about finding great locations and beautiful hotels for my retreats.